Tax reform is a controversial topic in the United States, and investors have definite opinions on how much income tax they should pay. 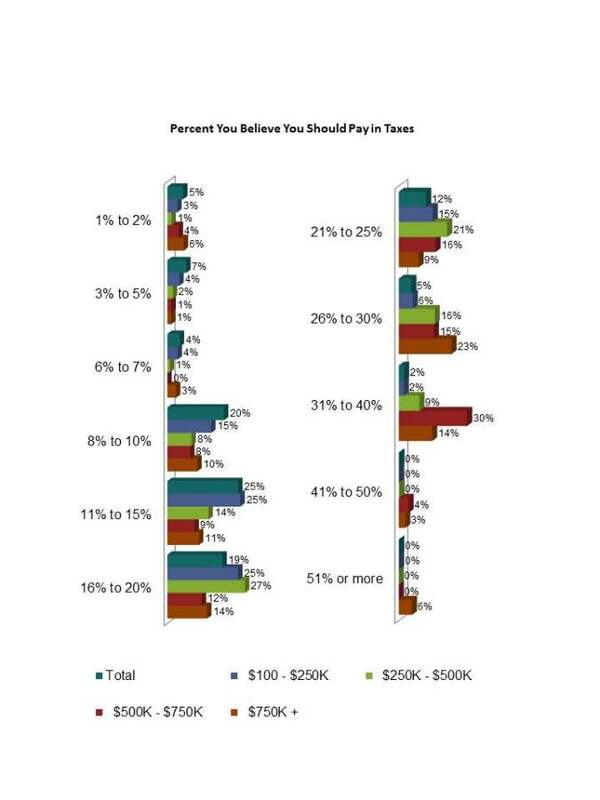 A Spectrem Group survey of high net income investors showed a wide divergence of opinion on how much American citizens should pay in taxes. While a majority of investors agree the amount should be between 8 and 20 percent, there are opinions that swing both far below and far above that number. For instance, 30 percent of investors with net income between $500,000 and $750,000 think Americans should pay between 31 and 40 percent in taxes. Even 14 percent of those with $750,000 or more think 31 to 40 percent is appropriate, while only 2 percent of all investors felt that way. Among the more moderate opinions, 20 percent of all investors believe Americans should pay between 8 and 10 percent; 25 percent said it should be between 11 and 15 percent and 19 percent said it should be between 16 and 20 percent. Another 12 percent said it should be between 21 to 25 percent, making 76 percent of respondents selecting between 8 and 25 percent. While study results had 31-to-40 percent as the highest tax rate acceptable to investors making $250,000 or more in income, from the $100,000 to $250,000 segment, 6 percent accepted the 26-to-30 percent tax range, and 2 percent was willing to go into the 31-to-40 percent bracket. Among the $250,000 to $500,000 income bracket, 64 percent selected between 16 and 30 percent. Sixty-one percent of the $500,000 to $750,000 income segment said between 21 and 40 percent. In the same study, investors were asked to select their national concerns, and 73 percent of the respondents selected “tax increases.” However, of greater concern was “prolonged economic downturn (83 percent), political environment (82 percent), and “national debt” (78 percent).